Manzanita is the common name for plants within the genus Arctostaphylos, a diverse group of evergreen shrubs native mainly to western North America, ranging from southern British Columbia to Mexico. Manzanita, Spanish for “little apple,” is a reference to the attractive round fruit that come in shades of green to red. These fruit adorn plants ranging in size and shape from prostrate ground covers to mounding shrubs and small, upright trees. Perhaps no genus among hardy shrubs features better bark effect. Especially on the upright tree forms, sinuous branches are wrapped in shiny, sometimes peeling, reddish brown bark, which provides year-round ornamental appeal in itself. Leathery leaves are borne vertically on the stems as a drought-avoidance mechanism for several species and may be various shades of green (enhanced in some cases with bright red new growth) or pale blue. Another favorable quality of this genus is the clusters of small urn-shaped, white-to-pink flowers that bloom in late winter into spring. Manzanita flowers provide color in the landscape and are a source of food for bees, hummingbirds and other pollinators during a time when flowers are scarce. Currently there are 105 species recognized in the genus Arctostaphylos. You may be familiar with the most common of them, Arctostaphylos uva-ursi, often referred to as bearberry or kinnikinnick. This low-growing, spreading species is unique in the entire genus, as it has a circumpolar distribution in North America, Europe and Asia. Because of its growth habit and hardiness, A. uva-ursi has found widespread use in landscapes as a ground cover. Unfortunately, it is often plagued by disease and insect issues and, because of its origin in cool, moist climates, is probably the least drought-tolerant species of the genus. 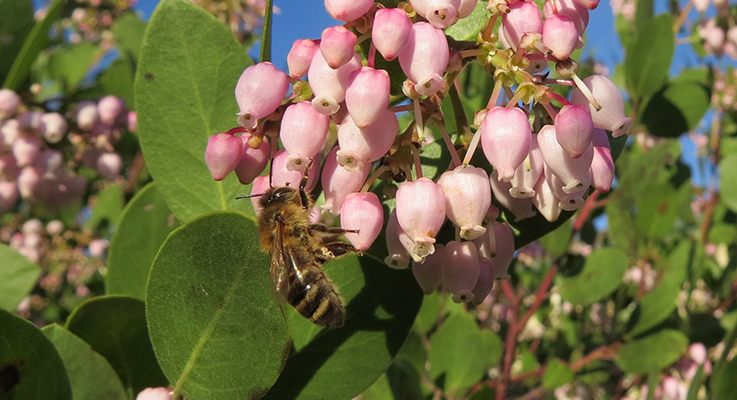 Many other species of Arctostaphylos are found throughout the West, yet have been used only sparingly in landscapes, except in California, where the genus exhibits exceptional diversity and where numerous cultivars are commonly available. In the interest of expanding the palette of manzanitas for landscapes in the maritime Northwest, an evaluation of manzanitas was begun in winter 2010 at OSU’s North Willamette Research and Extension Center (NWREC) in Aurora, Oregon. The evaluation is the latest in a series under the name Northwest Plant Evaluations, which are specifically focused on identifying shrubs, particularly ground covers, for use in unirrigated landscapes. Seventy-five cultivars and species selections were collected as cuttings from nurseries and botanical gardens in Oregon, Washington and California. The plants were rooted, grown on in 5.5-inch pots, and planted in a half-acre plot at NWREC in September 2011. After planting, the manzanitas received irrigation only until the fall rains began and have since followed the typical protocol for these evaluations and have received no supplemental irrigation. In addition, the plants were not fertilized or sprayed to control disease or insect pests, allowing for the evaluation of plant form and pest susceptibility in a low-input system. We logged several factors, including growth, flowering, cold injury, pest or disease issues, as well as an assessment of the overall landscape appearance of individual plants. In general, early growth in this evaluation was very vigorous, aided by mild temperatures the first two winters of 2011–12 and 2012–13, when the minimum temperatures did not drop below 24 degrees. The planting is in a Latourell loam soil, which, despite receiving no special preparation and an absence of fertilizer, promoted strong plant development. Manzanita has a reputation for slow growth, yet it’s typical for California selections (and other Mediterranean plants) to grow to considerably larger proportions in the Pacific Northwest than in their native environment because of the richer soils and more consistent moisture found here. Rather than a six-month drought period, established plants are confronted with only an effective three-month drought period. Growth slows and stops for the most part as soil dries out in July, and does not resume in earnest until fall rains and cooler temperatures replenish soil moisture. This growth pattern of summer dormancy and winter growth is a classical Mediterranean plant characteristic and is very much at odds with the usual temperate pattern of summer growth and winter dormancy. It makes the risk of winter injury in exceptional cold snaps the main limitation to growing some of these plants in the Northwest, as the actively growing plants lack sufficient cold hardiness. The winter of 2013–14 proved to be one of these exceptional cold snaps, as minimum temperatures at NWREC dropped to 10 degrees on December 8 and 11 degrees on December 9. This was sufficiently cold to severely damage or kill some of the plants in the evaluation, including some of the plants from more southern locations like Santa Rosa Island manzanita (A. confertiflora) and others from mild coastal locations such as Little Sur manzanita (A. edmundsii). Not surprisingly, cultivars and hybrids of A. uva-ursi proved to be among the hardiest in the evaluation. Many plants in the evaluation suffered leaf and shoot damage to varying degrees but recovered over the growing season. In the winter of 2016–17, this evaluation will be into its sixth growing season. Growing habits, potential size and flowering of all remaining plants are now very evident, making it possible to suggest some of them as suitable for specific roles in Northwest landscapes. Beginning with some of the smaller plants, one of the most unusual ground covers in the evaluation is an accession of Glossyleaf manzanita (A. nummularia) known only as “selected form,” which evidently originated at Tilden Botanical Garden. In our evaluation, this plant forms a dense mound of glossy green leaves about 18 inches tall and 4 feet across. As a ground cover it is taller than typical forms of A. uva-ursi and should prove to suppress weeds somewhat better as a result. It also has not displayed any drought stress, unlike A. uva-ursi ‘Massachusetts’, which is included in our evaluation and suffered considerable dieback after the hot, dry summer of 2015. Among taller ground covers, a number of A. hookeri cultivars have distinguished themselves as weed-suppressing shrubs with their taller, dense, spreading habit. These cultivars include ‘Buena Vista’, ‘Ken Taylor’, ‘Mills’, ‘Monterey Carpet’ and ‘White Lanterns’. Although these cultivars vary somewhat in size, in general they all form shrubs up to 3 feet tall and 6 feet wide or more. ‘White Lanterns’ is a bit of an exception to this in that it is a more rounded form rather than spreading, but the more upright form allows it to display its flowers more effectively; in bloom, it is a particularly attractive cultivar. The more upright plants in the evaluation exhibit a range of size, habit, flowering and foliage effect. As mentioned before, some manzanitas feature very pale blue, almost white, foliage. In the evaluation are several selections of Eastwood’s manzanita (A. glandulosa), a variable species distributed from Oregon through southern California which features distinctly blue foliage combined with white flowers in early spring. These are medium-sized shrubs up to 6 feet tall and wide. The largest plants in our evaluation are selections of Common manzanita (A. manzanita) or hybrids with it. These form small, upright trees and are the best for displaying both bark and flower effect, and because of that they are particularly good as wildlife plants. ‘Austin Griffiths’ is over 7 feet tall and even wider, with green leaves and clusters of pink flowers that appear in January and February. On warm, sunny winter days, the flowers are visited by multitudes of honeybees, bumblebees, hummingbirds and other pollinators. This is only a brief summary of the results obtained so far, but after six years it is fair to say there are some unique and well-adapted landscape plants in the evaluation. The collection of flowering data, as well as disease and pest information, is ongoing for this evaluation, as is cold-hardiness data when the weather intervenes. Future plans include expanding the collection with more accessions on an observational basis, as the range and complexity of this genus means there are far more selections and cultivars available than we have been able to include so far.